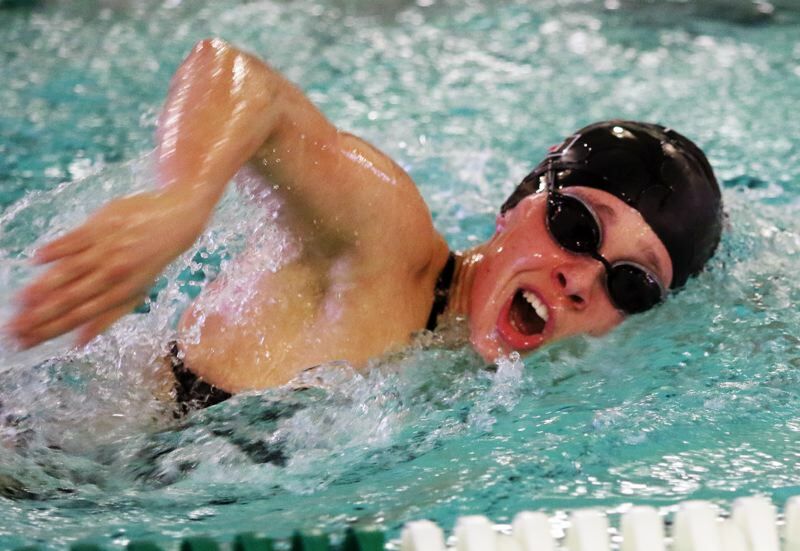 TIGARD — The Tigard High School girls swim team boasts some strong racers with a lot of potential. So does the Tualatin High School squad. So, when the Tigers and Timberwolves matched up last week, you knew it was going to be competitive — and fun. It certainly seemed to be both those things. 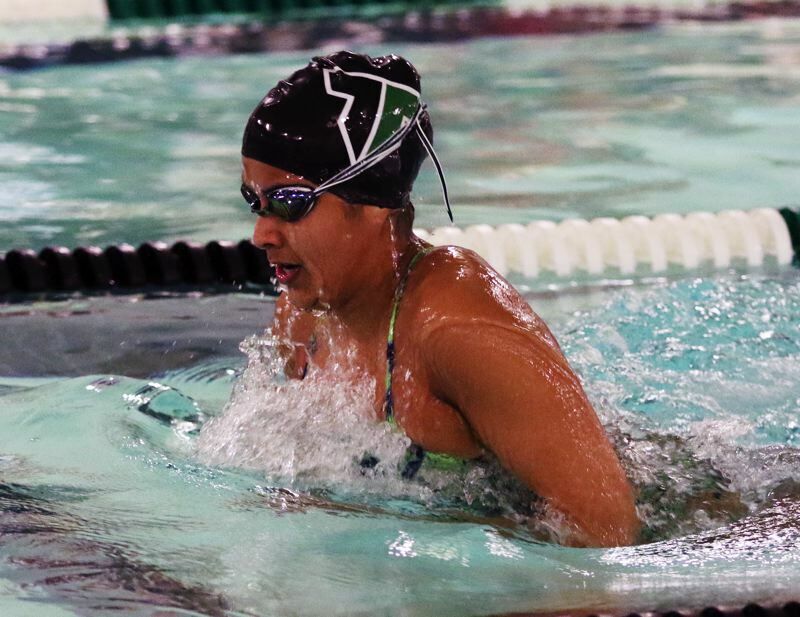 In a spirited battle between the friendly rivals, the Tigard girls came away with a 90-80 win over the Wolves in a Three Rivers League dual meet finale held last Thursday at the Tigard Swim Center. "This was a lot of fun," said Tigard senior Kaitlyn Wornath, who was a three-time winner on the day. "It's one of my favorite meets, for sure. We know a lot of people from club. It's just really fun to race with people you practice with." With the loss, the Tualatin girls ended the Three Rivers League season with a record of 1-5-1. The Tigers finished the TRL season with a mark of 3-3-1. "It was pretty great. Our girls won, and our boys lost, so it probably evened out," Wornath said. "Racing people that our probably at our speed is pretty fun." Wornath picked up a pair of individual victories at the meet. First, she sprinted to victory in the 50-yard freestyle in a time of 26.43 seconds. Then, she had a winning time of 1:00.05 in the 100 butterfly. Wornath also teamed with freshman Abbigale Elliott, senior Sahanna Saravanan and senior Elizabeth Perrin to win the 200 medley relay with a mark of 1:58.68. "It was pretty good," Wornath said. "I probably didn't swim my best, but I was happy with how it went." Saravanan also was a three-time winner for the Tigers for the day. 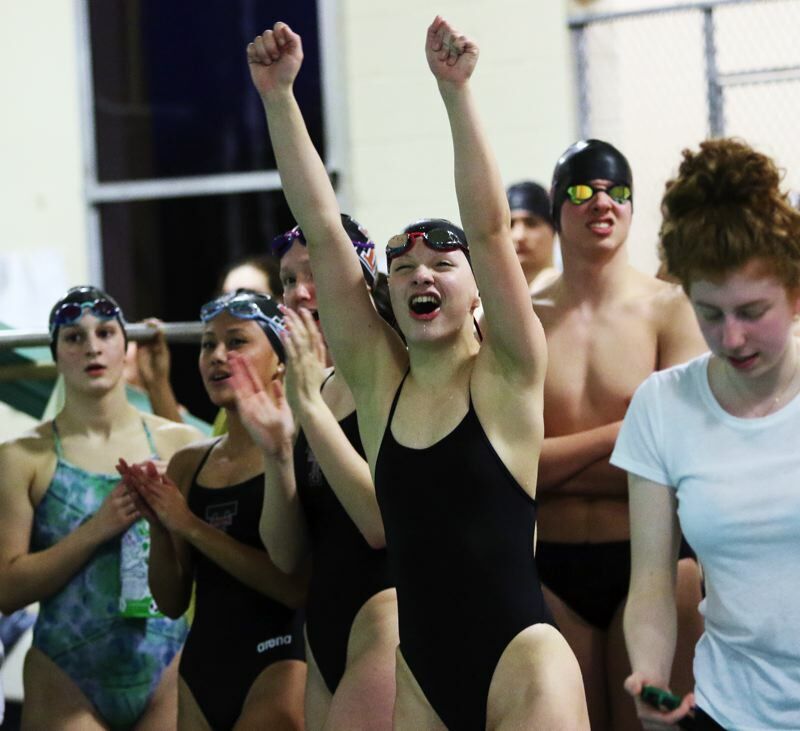 In addition to the medley relay, she also triumphed in the 100 freestyle, in a time of 57.88, and she had a winning mark of 1:13.83 in the 100 breaststroke. Also for Tigard, Elliott swam to victory in the 200 individual medley in a time of 2:21.30, and sophomore Jaime Cavalli came from behind to win a closely contested 100 backstroke race with a mark of 1:08.48. The Tualatin girls found plenty of success in the relay events at the meet. In the 200 freestyle relay, the Timberwolf team of junior Erika Farring, sophomore Isabelle Ehmig, junior Taylor Cockrell and junior Abigail Karsseboom had a winning time of 1:46.01. In the 400 freestyle relay, the Tualatin combination of Karsseboom, Cockrell, Farring and junior Britney Muralt triumphed with a mark of 3:55.65. Also for the Wolves, Karsseboom swam to victory in the 200 freestyle in 2:05.69 and Muralt won the 500 freestyle in 5:31.30. 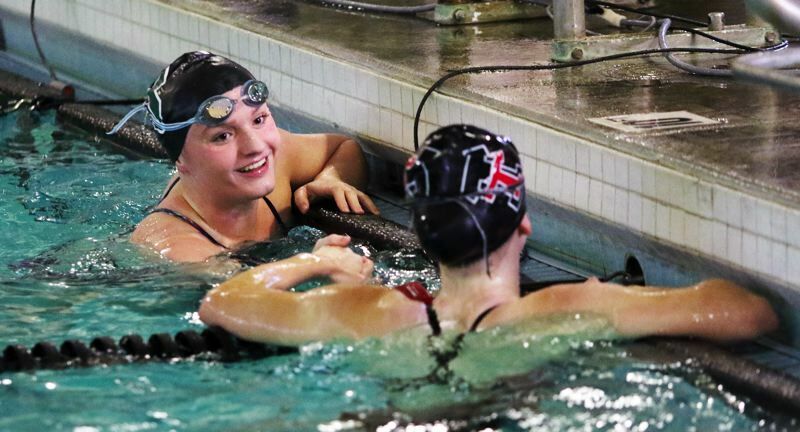 Next up for the Tigard and Tualatin girls teams will be the Three Rivers League district championships, which will be held Friday and Saturday at Mount Hood Community College. 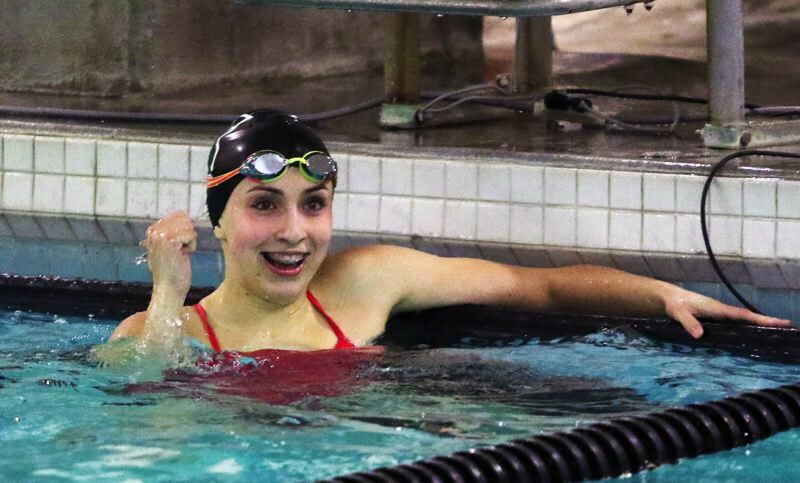 "I'm so excited for that," said Wornath, who will swim in the 100 butterfly and all three relay events at the TRL championships. "I'm really excited for state, too. I'm really excited for the relays."